After what seems like the longest stretch of gloomy weather ever in all recorded time, the sun finally came out. The cold came along with it, and that’s probably related, but it was worth it to see all that brightness again. Walking across a frozen lawn with the sun on my face is something I’d been missing for the last few months as I’ve been more used to shuffling in order to keep from slipping in the muddy mess I’ve been calling a yard. 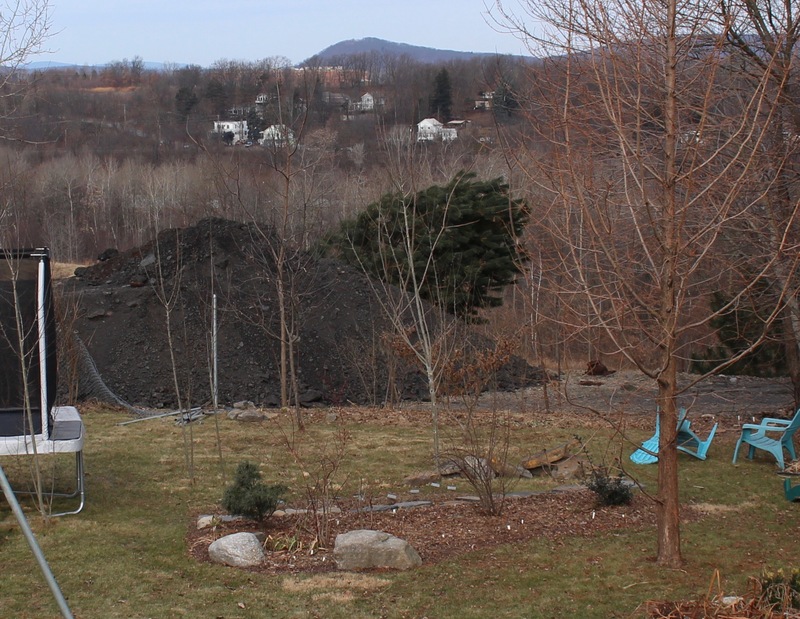 The sun also lifted some of the gloom and anxiety of all the earth-moving thats still going on behind the house. The lights of the industrial park seem to have caused a little state of emergency down at town hall, and apparently the mayor has declared that a wall must be built. So far the wall is completely ineffective in stopping the lights, but we now have a big beautiful wall of dirt and of course that must be a great thing. One of the dump trucks was rich in a bunch of relatively flat pieces of Pennsylvania bluestone. You can never have enough stepping stones so of course I was pleased. 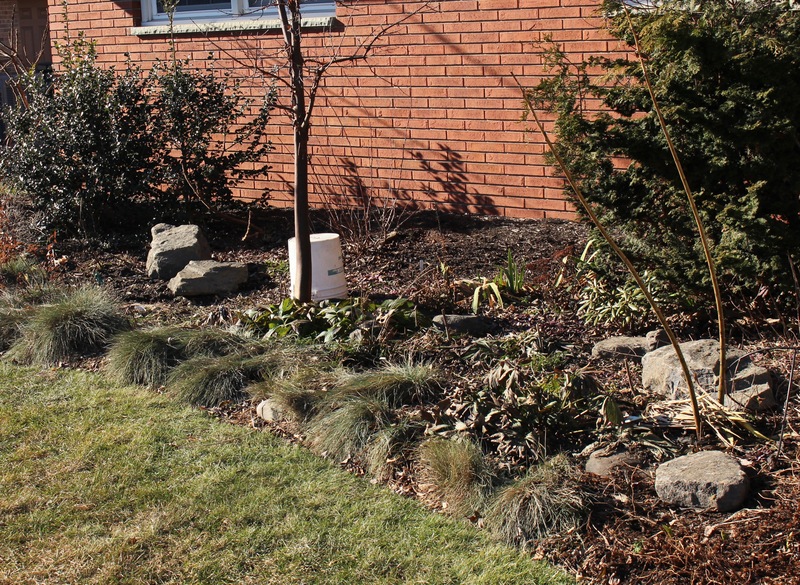 This afternoon I was inspired by the sunshine and upgraded the little stone accents in the front foundation plantings with some heftier rocks. It was easy enough to roll them around on the frozen soil, but the problem will come later when some planting I forgot all about sprouts up right where I dropped a 100 pound rock. 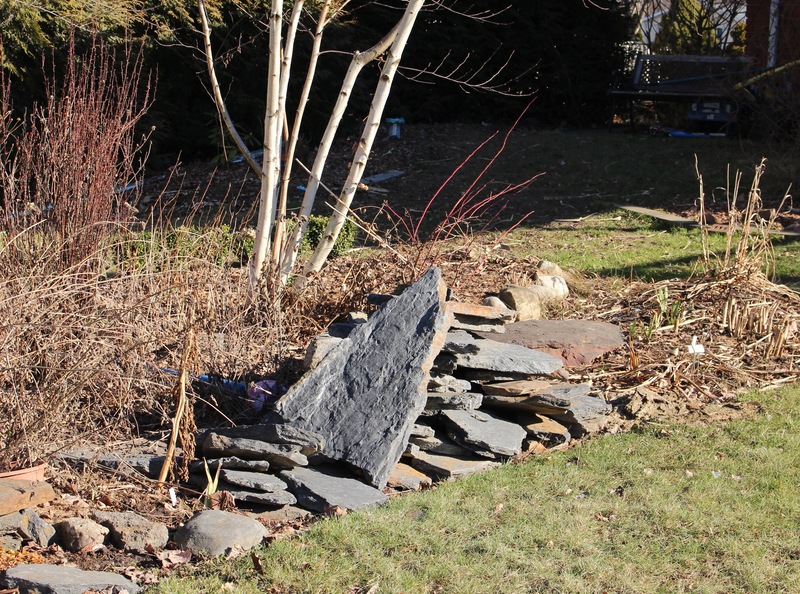 I’ll move the rocks some once spring arrives, but in the meantime I already like being able to jump from stone to stone rather than step on every important sprout that I forget is there. Those who like to point out the obvious will note that I should have used stepping stones rather than boulders if I was going to use them as stepping stones. I’d say that’s a good point. 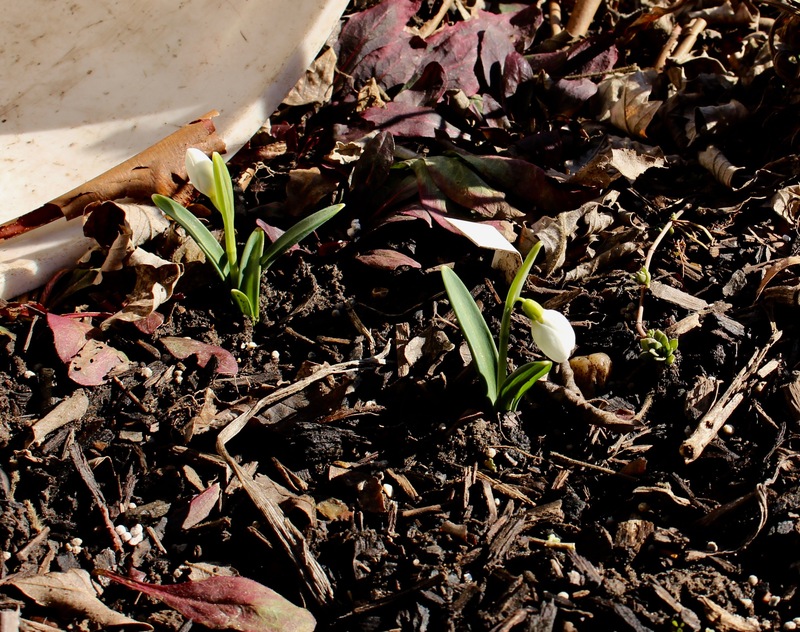 If you notice the big white bucket in the middle of the foundation plantings, and think you’re doing me a favor in cleaning it up, you’ll notice instead two foolishly early snowdrops sheltered underneath. Galanthus ‘Three Ships’ usually set sails for Christmas, but here in the cold north the end of January is more likely, and I for one am relieved I haven’t killed them yet. Honestly I was a little bored as I wandered about in the sun. You can only haul so many rocks, I wasn’t dressed warmly enough to just sit in the sun, and even for me it’s still too early for any serious cleanup so pruning was about all I could think of. I stood for maybe twenty minutes clipping dead leaves off the witch hazel. The flower buds were just starting to open and although clipping individual dead leaves off a bush in January is possibly the most pointless thing to do, I did it. 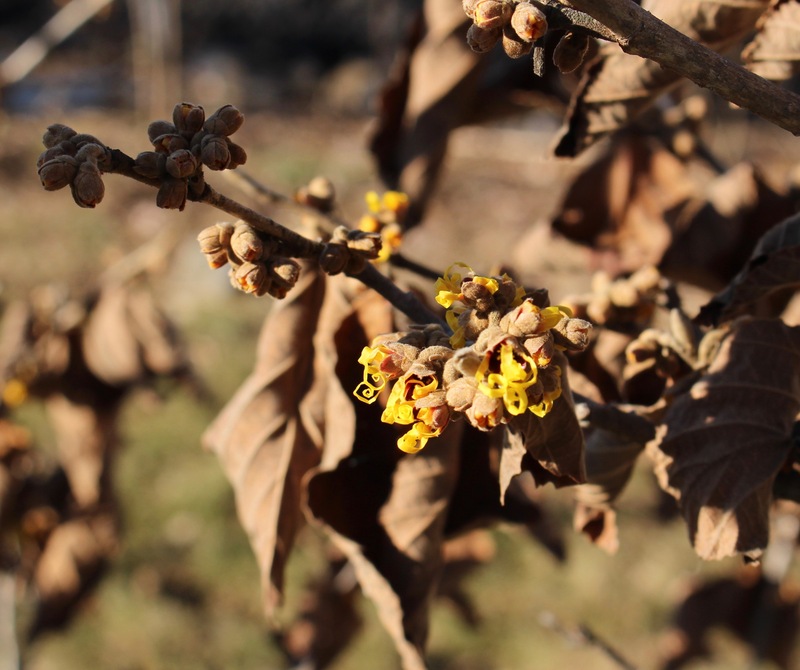 Chinese witch hazel (Hamamelis x intermedia ‘Pallida’) just starting to open in the warm sun. When you consider the usual barks and foliage that pass for winter interest in the northern zones I don’t get quite as excited as many gardeners do. I appreciate them, but I’m more of a flower kind of guy, and the fact that I was able find a few blooms here in NE Pennsylvania in almost the middle of January, while temperatures hovered at just below freezing, it made me pretty happy. Of course a greenhouse would probably make me happy too, but for now I’m going to stick with adding more witch hazels. Have a great week.